The commission to translate this monumental work came from the Oxford University Opera Club for its production at The Playhouse, Oxford in 1991. The title role was sung by Ian Bostridge. At the time AH was translating Mozart’s other great opera seria, La clemenza di Tito for Scottish opera and was also about to embark on The Marriage of Figaro for Opera North. 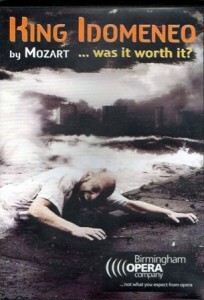 2008 Birmingham Opera Company – as King Idomeneo or He Had it Coming – directed by Graham Vick, designed by Paul Brown and conducted by William Lacey. that he’ll break me, and tear my soul apart. have you saved my shattered heart?